Woot woot…part of the laundry room is ready! I couldn’t wait for ‘the rest of the room to take shape, so here we go! FYI: The room has no light source other than that light you see here and I haven’t yet figured out how to take good pictures with a glaring bulb! Actually my original plan was to stay away from red in this room ( red is my favorite color too and shows up in most of the rooms) but when I was looking for accessories all I was drawn to was Red! The fact that most of those were on clearance at Target (think Christmas & Valentine’s) didn’t help either. So red it was! I started painting the Herringbone the traditional way, measuring and marking off sections, which was taking forever until B suggested something simpler. It is kinda similar to stencil but way more basic and easier! My arch nemesis during the makeover. This one just gave me a hard time at every turn! 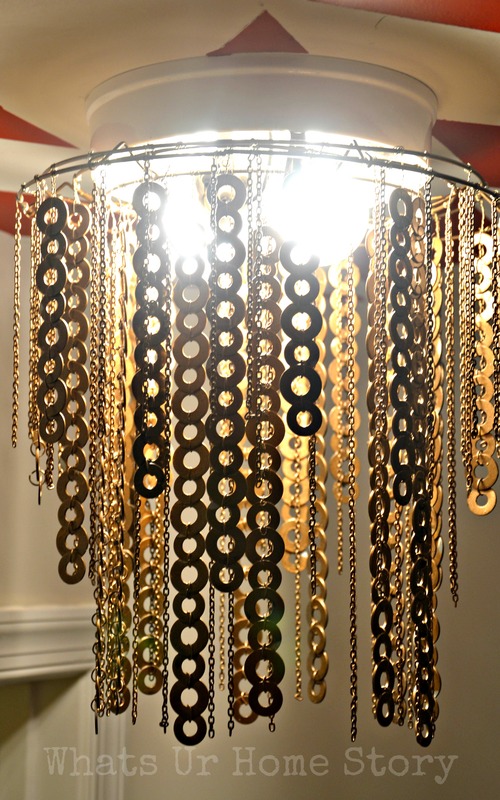 Yup, that chandelier is made of flat washers from the hardware store! Truth be told it is no fun stringing 400 Zinc washers in 2 days! Was definitely a test of my patience and endurance. Ok, now you can leave a collective sigh out, “WTF was my builder thinking when they carved out (yes literally the walls are not even straight) this room! Oh and I’m linking this to East Coast Creative’s “Creating with the Stars 2014 Contest” Link up. If you haven’t heard about it, it is The American IDOL of the DIY blog world. A reality blogging contest were 12 blogging stars mentor 12 contestants and they compete for 4 weeks, where the readers can vote them out. 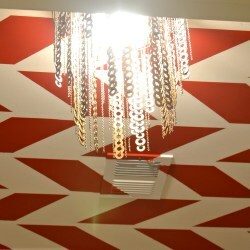 Love it…love it…Love it…love the ceiling and the fab washer chandelier!!! 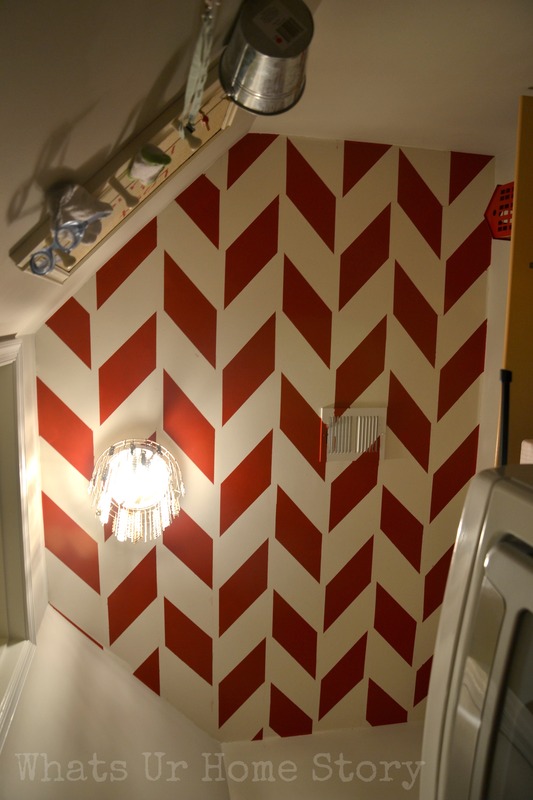 Kudos to u Vidya for pulling it off…it’s one glam laundry room…cannot wait to see the whole reveal!!!! Wishing u good luck for the contest as well!!! Thanks Anu. Finishing it in such a short time was an ordeal, that is all I can say. 🙂 I should plan better next time. Love it. Can’t wait to see the tutorial for making this Chandelier. That chandelier is just amazing!!! I hope you will come by and share at Redouxinteriors this Thursday at 1 PST when my link party opens! Love it! Would Love to Karen. I’ll be there. Thank you. L-O-V-E this Vidya! I may need to “borrow” the chandelier idea sometime. What cool ideas! I love both… How did you do the chandlier? I want to make one! Will post the tutorial soon, Lynn. Thank you. I absolutely love the look!! Nice job. Red is my favorite, love it! I knew it would turn out amazing!!! I can’t wait to see the full reveal. EC2 is gonna love you Vidya! Dear Vidya, I really appreciate ur creativity . The roof painting is really cool!! Keep it up! Good luck to u for the contest as well . Ha..ha…I know a lot of my friends were checking too to see what was going on. Glad it turned out great. 🙂 Thank you, Sammi. the ceiling looks amazing! my son would love it, too- his favorite color is red. he wishes we had more red in the house! and love the chandy- what a great idea! Yay, another Red fan! My daughter tries to rub it in sometimes that I’m siding with my son by adding more red around the house. :) Thanks Cassie. WOW. That took some patience! I love your plate wall, too! Very creative. The ceiling is great, but OMG I love your chandelier! That’s amazing! Rakhi, Ceiling was actually not that difficult. Will post the tutorial in a week or two. Awesome Job Vidya…I am sure the effort wont go waste…Good Luck on the contest!! I love it! I am thinking I could modify the design slightly to make the washers into Mickey heads to Disneyfy it. You did an awesome job and that is beautiful!!! Yes of course you can. That’s a great idea. Thank you! My first thought was, “I’m not sure about this” but the photos are awesome. You really pulled it off! Love the chandelier, but I really love the ceiling. Aww….thank you Lydia. The ceiling was way easier than I thought. Turned out amazing. Love it! Wow! That is amazing! I’m tots jellie!!! Awesome job Vidya!! I loved the ceiling and the chandelier too. Love the chandelier especially thinking of how you made it. Hi, I just hopped over from “Creating with the Stars” to see this beautiful chandelier you have created. It is gorgeous! 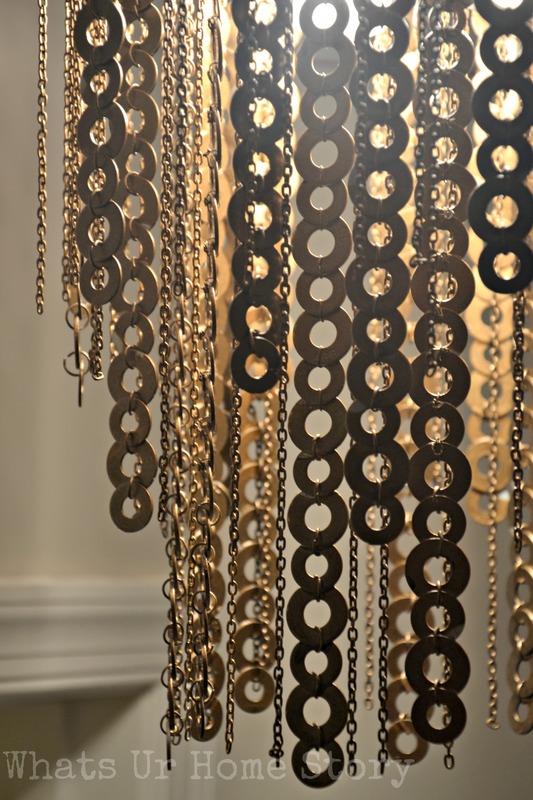 I am in the process of making a chandelier for my bathroom and yours immediately caught my eye! Started following you via google plus. Good luck with the contest! Aww…thank you so much Sherry. Would love to see you bathroom makeover pics. Already loving your family room. 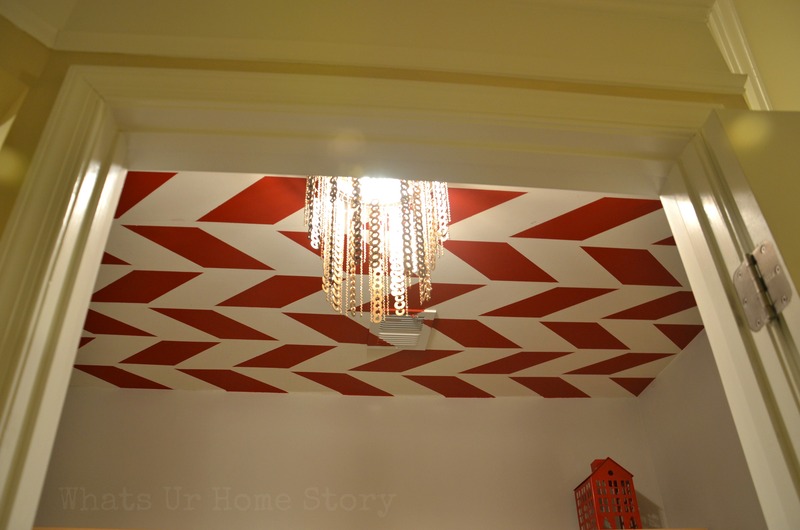 Vidya, I love your red ceiling…. (red is my fav too)..how did you do it so perfectly. And now coming to the chandlier…..it looks so glamorous….does not look like an easy job. I bow to your patience.